Fashion Stylist is a child theme of Blossom Fashion Free WordPress theme for creating a trendy feminine blog for free. Fashion Stylist looks absolutely stunning and is intuitive to use. The theme is designed carefully for creating fashion blogs, with modern layouts that help you increase user engagement on your website. Top class features with easy customization options give this free theme a premium feel. If you want to create a mind-blowing blog that is mobile-friendly, speed optimized, and search engine friendly (SEO) for sharing your ideas or creating an online store, Fashion Stylist is the perfect match for you. Start your own feminine website quickly without writing a single line of code. Customize the look and feel of the theme in a few clicks. Get a website that works seamlessly on every screen sizes, from mobile phones to tablets and desktops. Sell your own merchandises using the WooCommerce plugin and maximize profit. Grow your Instagram followers with an attractive Instagram section. Enjoy a Schema-friendly, SEO-friendly, and speed-optimized WordPress blog template for free. Create a blog even in Right-To-Left (RTL) scripts like Arabic. Fashion Blog – Write about the latest fashion styles and trends and share your opinions and tips about them using Fashion Stylist free theme. Makeup Blog – Do you think you are a good makeup artist? Got some tips for the girls out there? Write a makeup blog and make money while sharing your expertise. Beauty Blog – Give beauty tips, hairdressing ideas for different occasions, and tell the world how you stay beautiful with a stunning Beauty blog by using Fashion Stylist Free WordPress theme. Lifestyle Blog – If you have a style of living that you would recommend to all the females of the world or just want to write about the lifestyle of famous people, Fashion Stylist can help you with that. Gossip Blog – Like talking about latest trends and celebrities? Quickly create your own Celeb Gossip blog today with Fashion Stylist. You want a user-friendly and beautiful WordPress blog template for FREE! You have no interest in learning and writing codes to create your blog. You want a beautiful feminine and style blog to promote your offline store or create a complete online store. You want to bewilder your visitors with an impressive visual appeal. You want to become an authority on your niche. You want to start a fashion, lifestyle, beauty, makeup, gossip, food, or a journal blog. You can change the primary color and the background color of the theme with a click. Personalize your website with the color you like. Fashion Stylist works seamlessly on mobile phones. Since more than 50% of Google searches are being done on mobile phones, this fully-responsive feminine WordPress theme will help you reach a broader audience. Fashion Stylist Free WordPress theme passes Google mobile-friendly test. This means better rankings in search results and better user experience. If you don’t like the default fonts of the theme, you can quickly change it with a click. You can choose the font that suits your brand from 600+ Google Fonts. Fashion Stylist is fully compatible with the WooCommerce plugin. The theme even has dedicated sections for displaying your products on the homepage. With carefully placed shop sections, your online business will bloom in no time. Fashion Stylist has two header layouts you can choose from. Give a unique feel to your website by changing the header layout. You can choose from two different home page layouts on Fashion Stylist. This makes sure your website looks fresh and unique. Fashion Stylist allows you to display slider in two different formats. You can use the single post slider or multi-post slider for the above-the-fold content. The Instagram Section of the Fashion Stylist will help you increase your social media influence. The attractive Instagram layout lets you flaunt your Instagram account on your blog. We have put our SEO expertise into the theme so that you can quickly rank on the search engines. On top of that, we have made the theme Schema.org friendly which means you get SEO benefits over your competitors. Fashion Stylist comes with custom Advertisement widget that will help you easily display ads on the sidebar of your blog so that you can make money while writing about the stuff you love. Establish trust with your audience with an author bio. You can say something about you so that people feel they are talking to a genuine person. Flaunt your social presence! Fashion Stylist Free theme has widgets for all your favorite social media accounts. You can place your favorite accounts Instagram, SnapChat, Twitter, Facebook, and/or Pinterest profile on the sidebar! Grow your email subscribers with the perfect combination of Fashion Stylist Free theme’s newsletter section and the BlossomThemes Email Newsletter plugin, which will allow you to easily add subscribers and engage with them. If you want to display video on the top section of your website, Fashion Stylist allows you to add video from your Youtube channel or upload a video directly. Tell your audience and Google that you have updated a post by showing the last updated post date. This small feature will improve the SEO of your blog. Even a second matters. Don’t lose your visitor with a slow website. The speed-optimized code of Fashion Stylist makes sure that your users get fast loading experience. Also, Google prefers ranking fast webpage so speed matters. Let your visitors find you on social media and boost your business’ engagement. 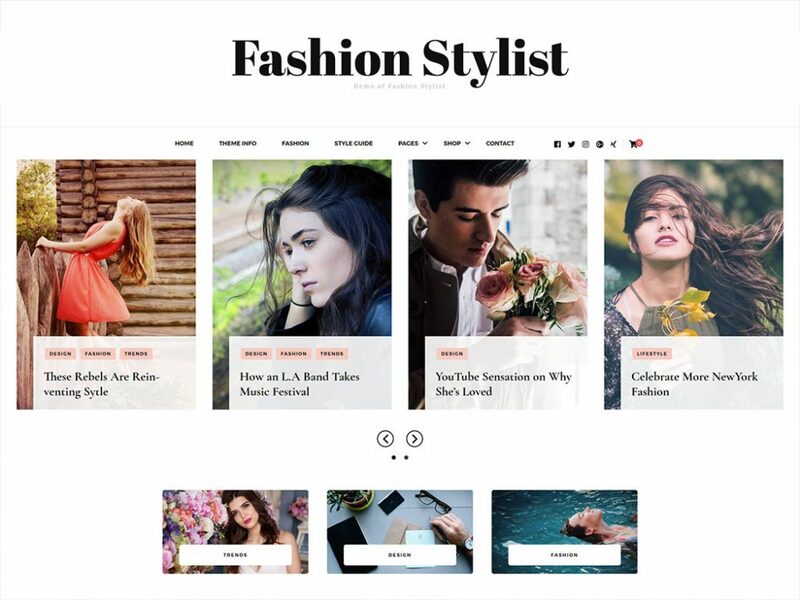 Fashion Stylist Free WordPress blog theme allows you to display your social media links on your website and also supports Russian and Chinese social media like OK, VK, qq, Zing, and others. Add unlimited social media to your blog! Increase the engagement on your blog by displaying related posts of the similar category as the post at the end of the single post page. This further helps you in internal link building and improves your on-page SEO, resulting in better Google ranking. Get your website ready with an extensive but simple and easy-to-follow theme documentation that comes with Fashion Stylist Free WordPress theme. Your blog can be set up in no time! Add and manage your widgets without compromising the design of your theme. Fashion Stylist Free is optimized for widgets so that you can design, and customize your blog in a truly unique way. Tried and tested, Fashion Stylist Free works seamlessly on the latest version of all the major web browsers including Chrome, Firefox, Safari, Internet Explorer, and Edge. Get maximum engagement from your visitors with Fashion Stylist Free’s breadcrumb option, which enables people to navigate easily all across your website. Make sure that your visitors are treated to an awesome font type that is of legible size, spaces, and contrast. Fashion Stylist Free optimizes the visual appeal of your content so that visitors enjoy what they are reading on the screen. Let there be no language barriers! Fashion Stylist Free theme supports localization so you can translate the theme in your local language. Write your content the way you want! Fashion Stylist Free WordPress blog theme supports right-to-left (RTL) scripts like Arabic along with LTR languages. Give your site its own unique identity. Fashion Stylist Free allows you to easily add your own logo to the website. Modify CSS effects or change the color of a section easily. With Fashion Stylist Free theme, you can add CSS effects right from the customizer. Very helpful and friendly 🙂 They help you as soon as possible, they also test in on their own!! Thank you for being so quick with resolving my issue!